I grew up in a small town -- not much different from the one you might imagine John Mellencamp grew up in. Largely industrial and agricultural, my town lacked any culture other than its own and had about as much diversity as a loaf of Wonder bread. 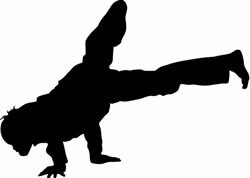 Although there was absolutely no urban element to my small town, kids there in the 1980s, just like young people all across the country, were fascinated with a new phenomenon called breakdancing. Living on the outskirts of town, my neighborhood consisted of ten houses in a row with a two-lane highway in front and a corn field speckled with oil wells to the back. While kids on our street spent a lot of time playing backyard baseball and riding bikes, breakdancing found its way to even our humble neighborhood. On a June night, I believe in 1983, my brother's friend next door had a birthday party -- he was ten. Upon arrival, kids were met with a blaring boom box and a large sheet of linoleum laid out on the carport floor. This was like no party our neighborhood had seen -- this was a breakdance party! For one night, the kids I'd played catch and traded baseball cards with were transformed into nothing short of the world's youngest (and only?) country b-boys. While some kids tried some more difficult moves, others (including myself) played it safe. With a bandana tied around my seven-year-old leg, I stuck with the basic knee spin. Quite honestly, this scene would have made an excellent episode of the Wonder Years. From there, my own personal obsession with hip-hop and breakdance continued to grow. On Halloween, when other kids dressed as monsters and vampires, I dressed as a breakdancer. While other kids were listening to glam-rock hair bands, I was listening to early rap music. Most people who popped in the Miami Vice soundtrack rocked out to Glenn Frey's You Belong to the City. My favorite track was Melle Mel's Vice. Even a few years after my neighbor's party, I was still interested in breakdancing at a time when my school held its annual book sale for students. We were given a day to browse the selections before having the opportunity to purchase books if we wanted. As my classmates and I checked out the offerings, we quickly noticed an instructional book on breakdancing -- but there were only two copies! Although the challenge went unspoken, we all knew that securing one of those books would be difficult. Sale day arrived and our class was dismissed to make our purchases. Leaving the classroom that day was much like the running of the bulls as a small group of fifth graders walked as quickly as possible towards the sale -- there was no running in the hallways. The first copy of the book was snatched up by a classmate but my hands latched on to the second. It was the key to becoming an awesome breakdancer and it was mine. As you might expect, however, I never became much of a breakdancer. That's not to say I haven't had my moments -- in particular, one night in college when a friend and I pulled back the carpet in my dorm room, applied a coat of furniture polish to the tile, and spent a few hours bustin' out the best moves two white boys and a few bottles of Night Train could come up with. Breakdancer or not, I still love it. I love the music, the moves, the art, the culture. With a subculture such as this, if you will, comes some amazing talent. At the same time, however, there also comes some very mediocre performers. Take a look below at a few examples of the good, the bad, and the...um...interesting. Ricky and Alfonso stole my knee spin. Oh yeah, the knee spin. That was about my limit. The wave, a half-hearted caterpillar, and the freakin' knee spin. Unplayable movies and other treasures.